Built with commercial-grade components, the ProLine® gas models are engineered to help lower your energy bills and provide exceptional reliability. 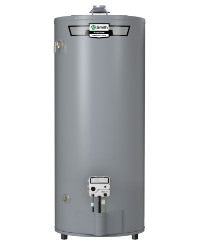 ProLine Gas Water Heaters offer a wide range of water heating solutions—from models that help you qualify for gas utility rebates to high recovery models ideal for large families with high demand for hot water. 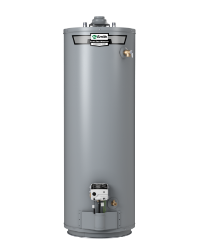 And, our specialty vent gas water heater options can be installed almost anywhere in your home because they can vent up to 40 feet. Our direct vent models feature two-pipe combustion systems that draw clean air from outside the home, eliminating any worries about indoor ventilation. 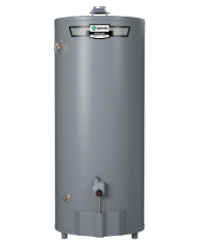 ProLine is an economical water heater designed for households that need an exceptional performer and provides long-lasting value. Patented “Eco-Friendly” design reduces NOx emissions by up to 33% and complies with less than 40 ng/j requirements for low NOx. Great for big families and high-demand applications, the ProLine Plus High Recovery model delivers hot water up to 150 gallons in the first hour. The ProLine Plus High Efficiency line can help reduce homeowner energy bills and also qualifies for most gas utility rebate programs, ENERGY STAR Home Program recommendations and California Title 24 requirements. Side Loop units are used for installation with combination space heating/potable water heating applications (i.e. : heat exchanger) or any system requiring a recirculating hot water loop. Featuring the Ultra-Low NOx Burner System, these water heaters help to reduce NOx emissions by 10-15% and decrease NOx emissions by up to four times. This model is equipped with a pre-wired, factory-mounted blower. This blower produces a pre-ignition draft of make-up air prior to burner ignition, provides more efficient control of heat and helps ensure an adequate supply of make-up air. 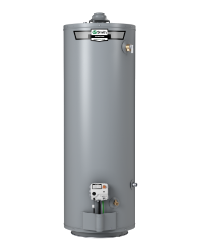 The GCN-100 is an atmospheric vent, residential gas water heater with NOx emissions of less than 14 ng/j and meets the efficiency requirements of the U.S. Department of Energy and Current Edition ASHRAE/IESNA 90.1. ProLine Direct Vent models install easier in more places, with a one-pipe dual-channel closed system that draws all made-up air from outside of the home, eliminating issues caused by insufficient indoor ventilation. The ProLine Power Vent water heaters have been engineered to maximize efficiency and deliver greater efficiency. 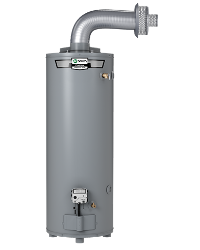 The ProLine Ultra-Low NOx power vent water heaters utilize an innovative burner system, a combination of radiant heat and excess air to comply with SCAQMD Rule 1121 and other Air Quality Management Districts with Similar Requirement for less than 10ng/j for ultra-low NOx emissions. These models qualify for ENERGY STAR. ProLine Closed Combustion Power Direct-Vent Gas Water Heaters offer horizontal and vertical venting options (up to 45 feet) using installer-friendly plastic material. Offering a closed combustion dual-channel vent system, the Side Loop Direct Vent models draw combustion air from the outside and vent to the outside of the home. ProLine Side Loop Power Vent models will vent using installer-friendly plastic material and also feature an advanced Intelli-Vent™ gas control valve with rugged silicon nitride hot surface igniter. Offering greater reliability and more venting options, these models vent up to 45 equivalent feet with installer friendly plastic material and also feature an advanced Intelli-Vent™ gas control valve with rugged silicon nitride hot surface igniter.